The last time you saw the laundry unit, the main structure was in place but it was still in a very rough stage. 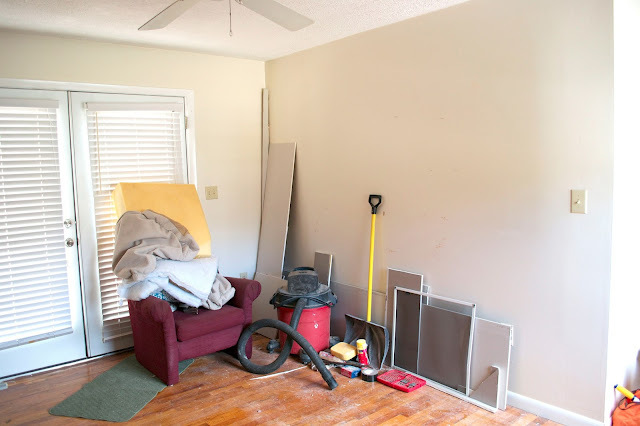 The first thing we did to start the finishing process on the unit was to bust out the stain and give the countertop, shelves and rod a darker look to match up with the rest of the room. Then we added trim to the front of the shelves and to the edges of the boxes so there wouldn't be rough edges exposed. We still need to add some trim at the top and paint out the bottom of the shelves that you can see. I picked up some baskets from TJ Maxx and now they store Will's clothes that don't fit yet and various other things like bibs and socks. We also added some angled supports for laundry baskets in the bottom boxes. We decided to go with angled supports (instead of straight like this pinterest inspiration) so that we can easily toss dirty laundry into the appropriate baskets. We need to add the supports to the other side and paint those as well and once we do that we'll be done! In case your like me right now and can't remember two seconds ago let alone months, here is a comparison of what this part of the room looked like in the fall vs now. It looks great! 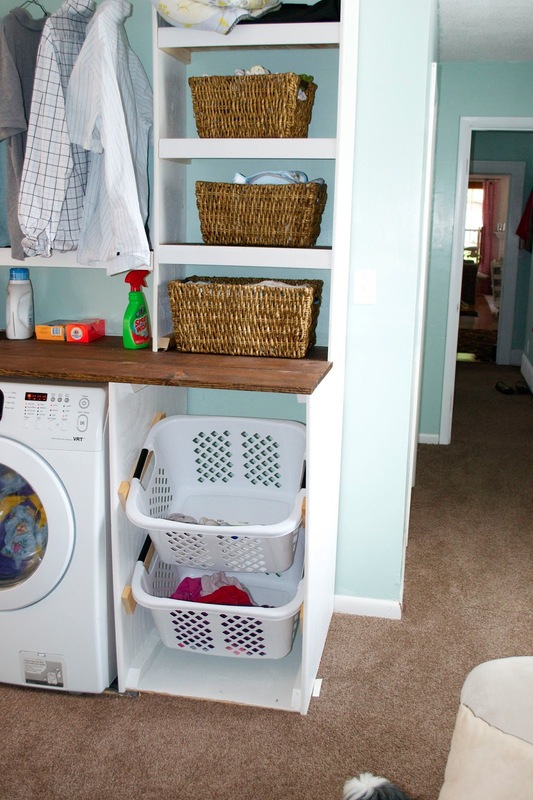 I love the built in baskets. You wooden worktop is so nice too! 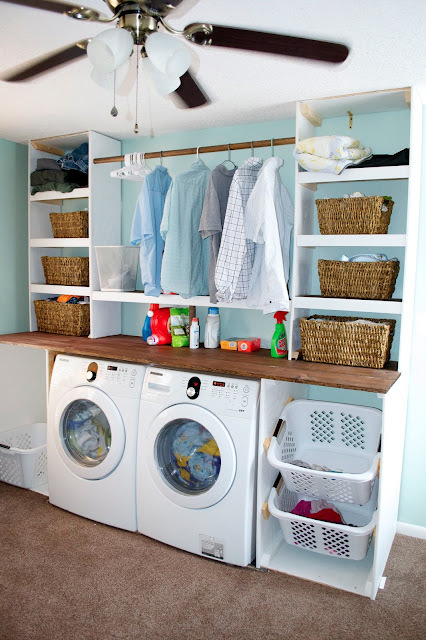 I need one of those to top my washer and dryer. I really like what you've done here. We just finished out a room in our basement to relocate the laundry room & workout room. 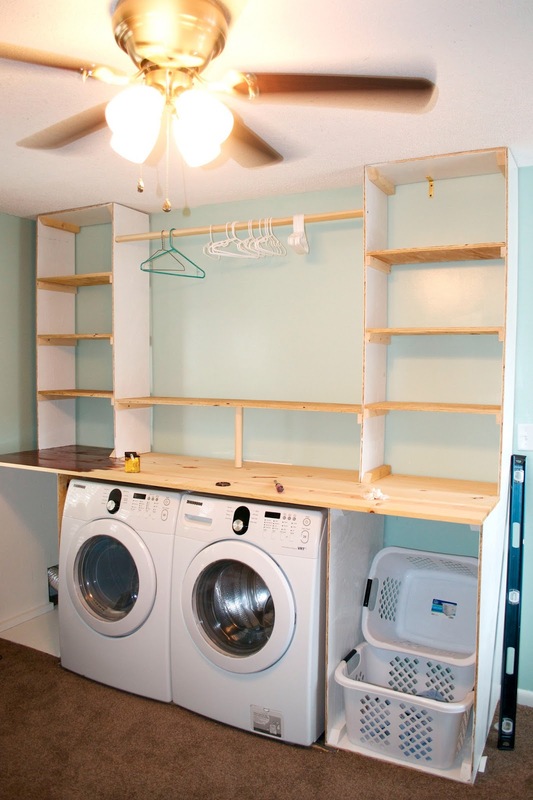 I had something similar in mind and am happy to be able to SHOW something similar to my husband so he will get on board with DIY vs stock cabinetry. Great job! This is such an amazing organized space. 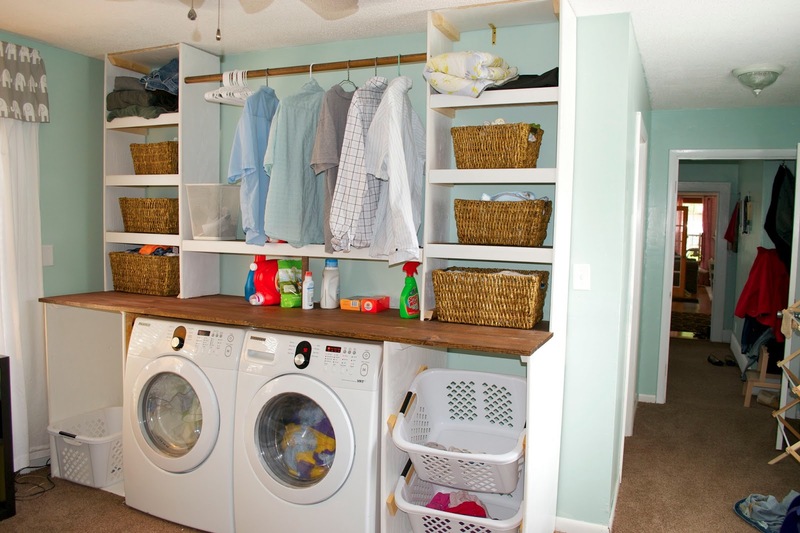 We just redid our laundry room recently... I wish I had enough room to include some of the elements that you have incorporated. Great job!! Love this! Do you have detailed directions anywhere? This is the best I have on our site http://www.ckandnate.com/2013/04/bones-of-laundry-unit.html. 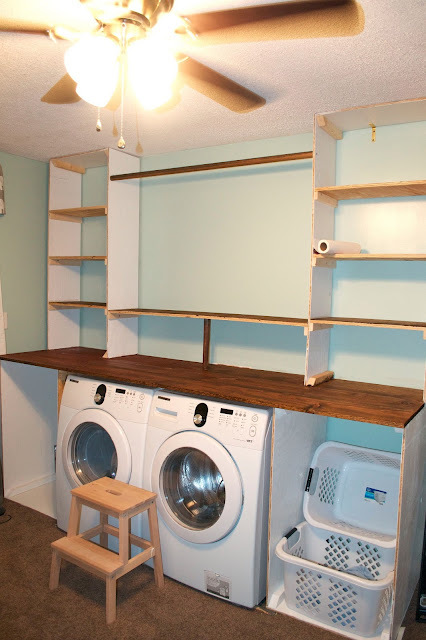 I wrote a post for Remodelaholic about it which you can find here http://www.remodelaholic.com/2014/09/built-in-laundry-unit-shelving/ which goes from start to finish on the process. Our go to stain is Minwax Dark Walnut. I hope that helps!